Consumers are advised to immediately stop using recalled Emerson-brand wet/dry vacuums because they could shock the user. 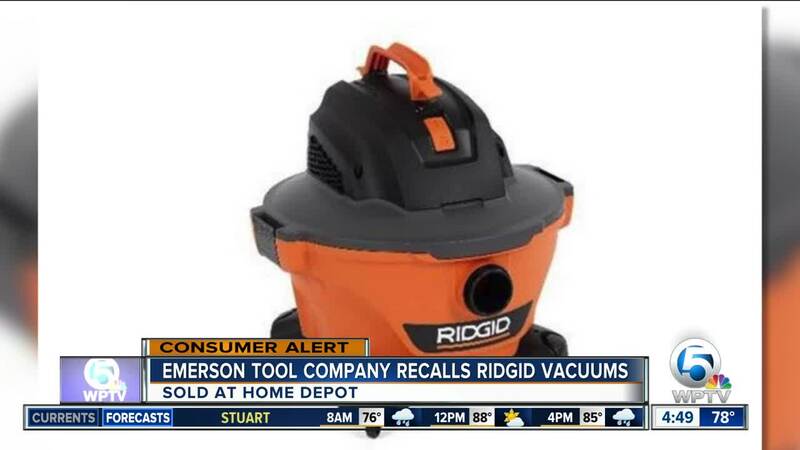 Sold exclusively at Home Depot stores across the U.S. and the company's website, the Consumer Product Safety Commission said Tuesday consumers should immediately contact Emerson Tool Company for a free replacement. The recall involves RIDGID NXT wet/dry vacuums, models HD06000 (6-gallon) and HD09000 (9-gallon). The orange and black wet/dry vacuum has four swivel casters, a carrying handle, a hose and accessories. RIDGID is printed on the front of the vacuum. The model number can be found on a silver product identification label on the back of the vacuum’s powerhead assembly. The vacuums were sold from March 2018 through July 2018 for about $50 for the 6-gallon wet/dry vacuum and for about $60 for the 9-gallon wet/dry vacuum. Call Emerson Tool Company toll-free at 888-847-8718 from 9 a.m. to 6 p.m. ET if you have questions.